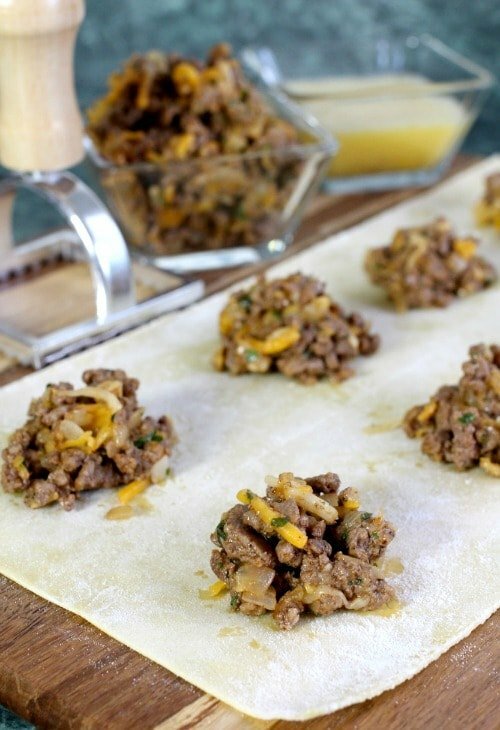 If you’re family loves tacos then they’re totally going to flip over this Taco Ravioli! 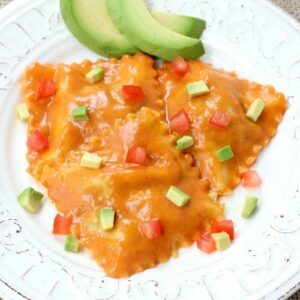 All your favorite taco flavors wrapped up in a ravioli dinner! 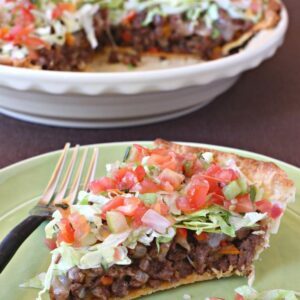 This week were cooking up Tex-Mex with our friend Shelly over at Cookies and Cups. We started with nachos – ours were low carb cheese crisp nachos and hers were Skillet Frachos. 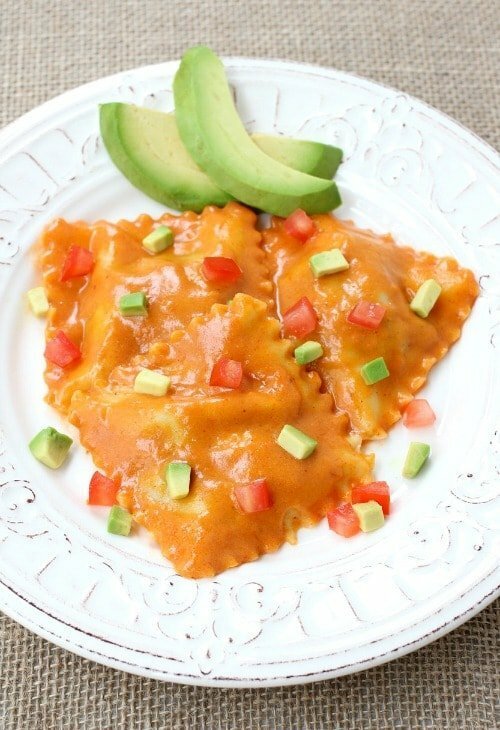 So now we’re moving on to dinner and for us it was this Taco Ravioli. Don’t be afraid…We’ve never made homemade ravioli either. It was a lot easier than we thought it would be and it’s definitely something we’ll be making again. Really soon. We decided to use store bought fresh pasta sheets instead of making our own dough. Not making the pasta from scratch was a great short cut to take and I have seen them in most grocery stores – even if they’re frozen – but if you can’t find any you could also use wonton wrappers. Since we had the pasta sheets already made all we had to do was make a filling and a quick sauce. We started by browning some ground beef in a large skillet and adding our seasonings. Cumin, chili powder and garlic. Next in the pan goes a diced onion and a bunch of garlic cloves. I’ll say three for the recipe but our was more like 6. We’re big fans of garlic around my house and if we all eat it we’re OK right? 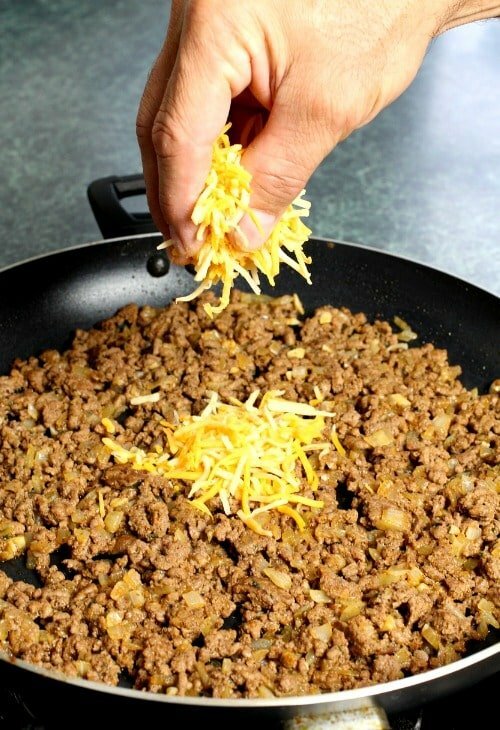 Stir in a cup of taco seasoned shredded cheese and the filling for your taco ravioli is done. Then your going to spread egg wash along the edges of the pasta sheets and also in between where the ravioli will be cut into squares. We used a ravioli cutter like this one that we got on Amazon, but you can use a pizza wheel or even just a knife. Repeat until you have about 40 ravioli, depending on the size you’re making them. If you don’t need all 40 ravioli for dinner (in my food-disappearing house we did) you can freeze whatever amount you don’t need for another meal. 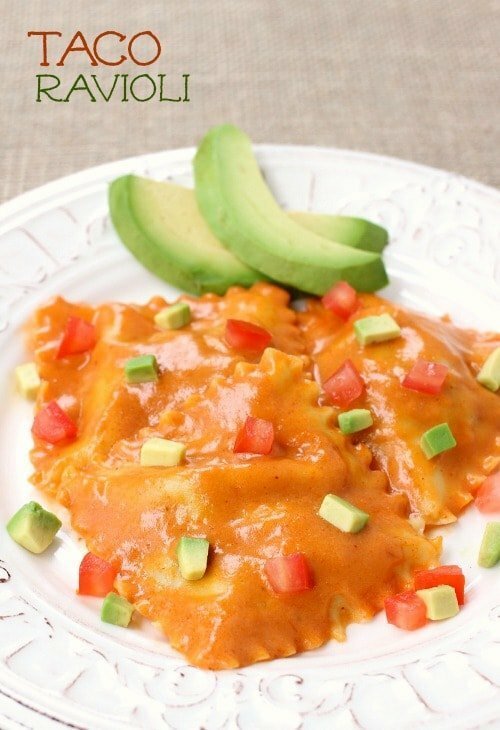 The sauce for these Taco Ravioli is the quick and easy part of this recipe. All you need is a can of enchilada sauce, chicken broth and cream cheese. Cook that all together and the sauce is done. 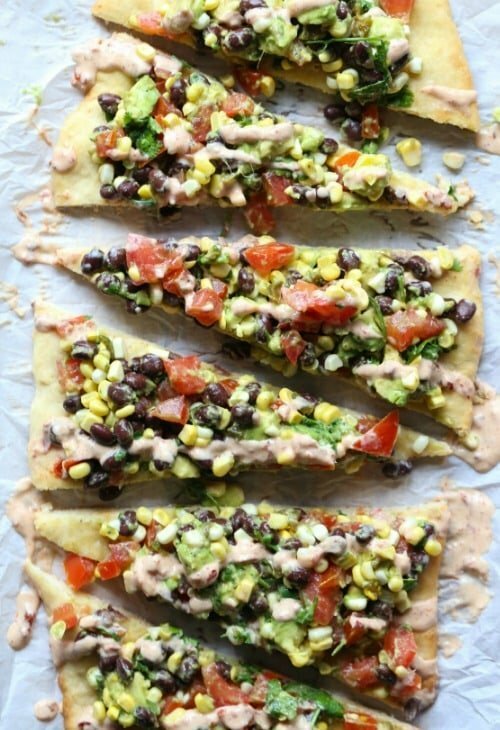 While we were working on all the ravioli, Shelly was making her Cowboy Caviar Pizza. How amazing does this look? All of my favorite ingredients turned into pizza form. I think we’re in some good shape now for our Tex-Mex dinner! How lucky are we that we get to eat all this delicious food and share it with good friends? All were missing now are the cocktails! This recipe makes 40 ravioli. The idea here is to make the ravioli once and freeze it so you have another meal or two. 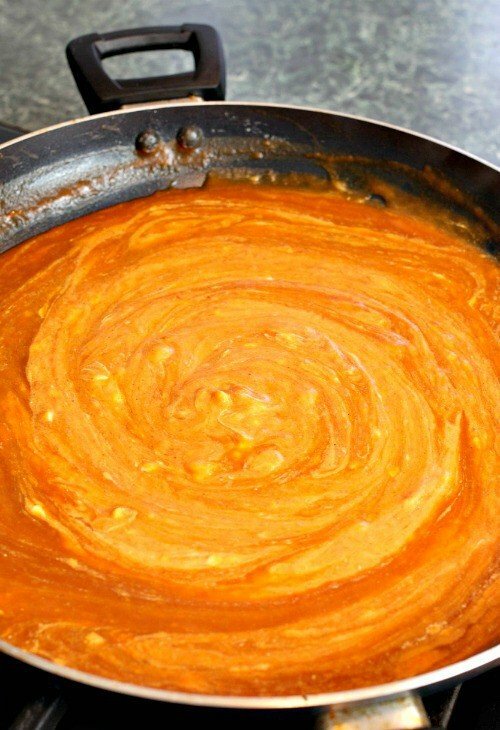 The recipe for the sauce will be enough for a meal for about 6 servings. Start by browning the beef in a large skillet with the olive oil. When the meat is half way done cooking, add the onion and garlic and cook until the onions are soft and the meat if fully browned. Stir in the cumin, garlic powder, salt, dried parsley and the 1/4 cup of enchilada sauce. Once combined, stir in the cheese and set the filling aside. Brush all around the pasta sheet edges with the egg wash and also in between each filling pile. Lay another pasta sheet on top and press to seal around all edges and in between each ravioli. Press down over the center of each ravioli with a ravioli cutter. A cutter like this will cut and seal the edges at the same time. See the note below if you don’t have one. Start a large pot with water to boil over high heat. Once the water is boiling add a handful of salt and then 7-8 of the ravioli, depending on the size of your pot. 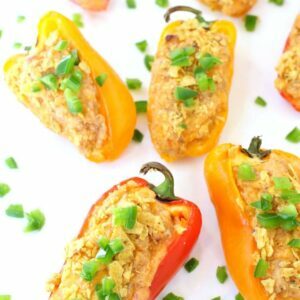 These will only take about 5 minutes to cook, drain them on paper towels and then you can add in the next batch. Cook up as many as you want for dinner and you can save the rest or freeze them. While the ravioli are cooking you can put the sauce together by adding the butter to the same skillet you used to make the filling. Once the butter is melted and the flour and whisk for one minute. Next pour in the chicken broth and enchilada sauce, whisking as you pour. Let this thicken over medium heat for 5 minutes and then stir in the cream cheese. You can either add the ravioli to the sauce to toss or plate the ravioli and sauce them on the plate. We like to add all the ravioli to the pan and cover it until we’re ready to eat. 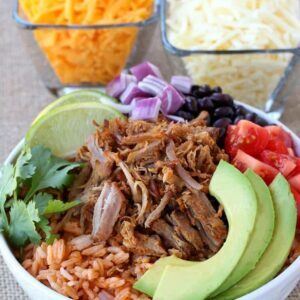 Garnish with avocado and tomatoes. If you can’t find fresh pasta sheets, you can substitute with wonton wrappers. Also if you don’t have a ravioli cutter you can use a pizza wheel or a knife, just make sure to crimp and seal the edges of the ravioli after so the filling doesn’t leak out. I seriously need to make this for Jake!He would go crazy!